Martha Wells returns to the Raksura with a pair of brand-new novellas! In The Falling World,” Jade, sister queen of the Indigo Cloud Court, has traveled with Chime and Balm to another Raksuran court. When she fails to return, her consort, Moon, along with Stone and a party of warriors and hunters, must track them down. Finding them turns out to be the easy part; freeing them from an ancient trap hidden in the depths of the Reaches is much more difficult. The Tale of Indigo and Cloud” explores the history of the Indigo Cloud Court, long before Moon was born. In the distant past, Indigo stole Cloud from Emerald Twilight. But in doing so, the reigning Queen Cerise and Indigo are now poised for a conflict that could spark war throughout all the courts of the Reaches. Stories of Moon and the shape changers of Raksura have delighted readers for years. This world is a dangerous place full of strange mysteries, where the future can never be taken for granted and must always be fought for with wits and ingenuity, and often tooth and claw. With two brand-new novellas, Martha Wells shows that the world of the Raksura has many more stories to tell . . .
Martha Wells is the author of more than a dozen fantasy novels, including The Wizard Hunters, The Ships of Air, The Gate of Gods, The Element of Fire, and the Nebula-nominated The Death of the Necromancer. 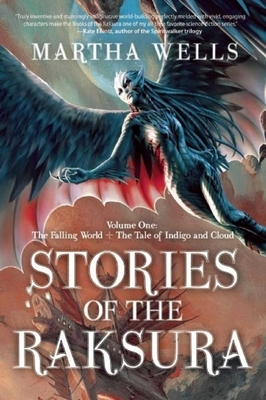 A full-length trilogy introducing the Raksura universe was released in 2011 and 2012, and is followed by a two-volume set of four novellas, all published by Night Shade Books.